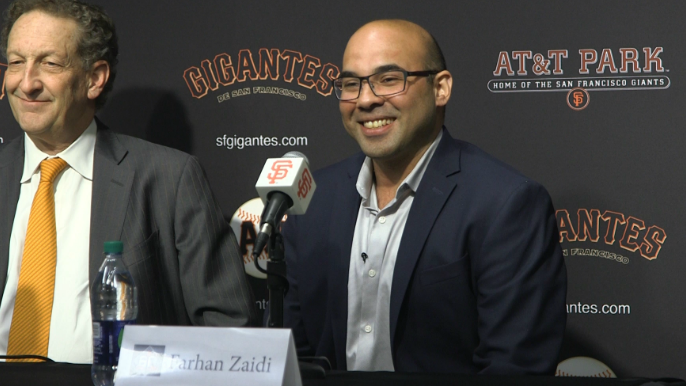 New Giants president of baseball operations Farhan Zaidi held his introductory press conference on Wednesday afternoon, less than 24 hours after accepting the job, and vacating his position as the Dodgers general manager. The lengthy inaugural discourse with the Bay Area media was wide ranging, but many questions surrounded the prospect of rebuilding, and how Zaidi plans to make the Giants contenders once again. “We’ve had the opportunity to talk about that over the last few days,” Zaidi began when asked by Henry Schulman about the direction of the team. “As Larry (Baer) said, I’ve had the good fortune of being in the playoffs for a few years now. The one thing that stood out to me, the thing that I appreciate most about that stretch is just playing meaningful baseball, day in and day out, game in and game out. How energizing that is for the fans, and for the players. Kind of playing out the string in a season where you’re totally out of the playoff race, it takes its toll on the fans, the players, the entire organization. Zaidi then hinted at the types of moves he values, using his former colleagues at the Oakland A’s as an example. “They traded for Khris Davis three offseasons ago, coming off a season when they won 68 games,” Zaidi explained. “And they traded a couple of prospects to acquire this player who was heading into arbitration. You look at that trade and it’s maybe not your typical move for a ‘rebuilding team,’ but I think their mantra was let’s go out and identify value where we see it, and just make this team better one move at a time. They obviously reaped a terrific payoff for it this season. They made some other moves this past offseason, Steven Piscotty was another player they acquired trading prospect capital away. Zaidi was then asked specifically about the prospect of trading Madison Bumgarner, who currently has one year left on his deal before he’s scheduled to hit free agency for the first time in his career. Zaidi began by demonstrating his reverence for Bumgarner, before reiterating that everything is on the table. “The last time I was going through this interview, job transition process was in 2014. I was in the Oakland airport watching the end of the 2014 World Series, and I saw Madison finish off that superhuman effort in that last game,” Zaidi said. “It’s funny, I remember at the time thinking: I’m working with the A’s, I may be going to the Dodgers, two Giants rivals, and I can’t help but as a baseball fan have such an appreciation for what this team and this guy have just done.